On May 27 2015, Forbes magazine announced that Madonna topped the annual list of top-earning musicians and also claimed the No. 28 spot on their list of America’s richest self-made women. The wealthiest musician on the list, Madonna has an estimated net worth of $520 million, with her main source being from music, clothing, and real estate One of the top pop divas of all time. Her tours have grossed an estimated $1.2 billion over the years, including $305 million from her 2012 MDNA tour. That helped her earn an estimated $125 million during the ensuing 12-month period during which Forbes calculated celebrity earnings, more than any other musician. Look for another bump when she goes on the road with her latest album, Rebel Heart, in August. 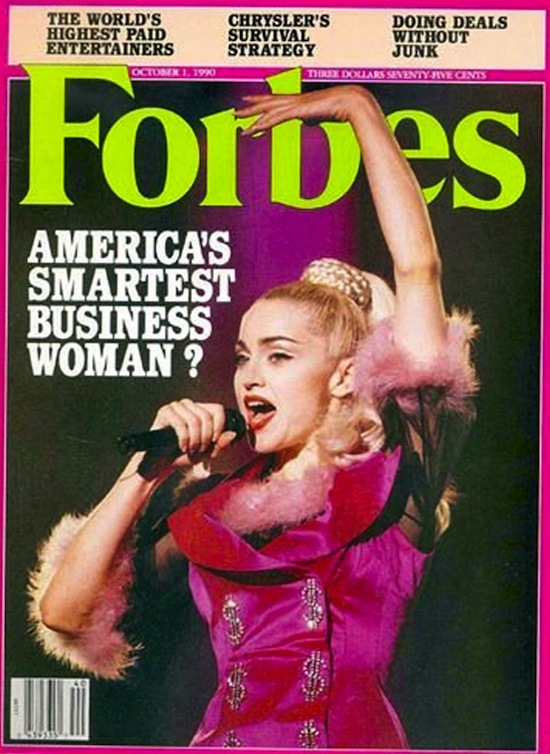 On June 29 2010, Forbes announced that Madonna was listed as the #10 most powerful celebrity, down from #3 in 2009. On October 1 1990, Madonna was named the top-earning female entertainer of 1990 by Forbes magazine with an annual income of $39 million. SHE HAS JUST FINISHED a rigorous song and dance routine in Nice, France. Madonna Ciccone, the 32-year-old bleached-blonde pop star, walks across the stage and pretends to rough up her background vocalists. Clad in an ivory-colored bustier and trousers from a business suit, Madonna then looks out at the crowd of 35,000 fans, grabs her crotch, raises her fist and yells, “I’m the boss around here.” The crowd roars. This routine was repeated at almost every Madonna performance this summer, but it’s more than play-acting. She is the boss. She is the president and sole owner of a multi-million-dollar corporate organization that in peak season has hundreds of employees and operates through nearly half a dozen entities, including Boy Toy Inc., Siren Films and Slutco. Congratulations, Madonna. The critics may attack you, but you are one heck of a moneymaker. The nation’s top-earning female entertainer for 1990, Madonna brought in an estimated $39 million in pretax earnings. She has staying power, too. While performers like Whitney Houston and Cyndi Lauper rise fast and fade fast, Madonna has stayed near the top for all five years FORBES has compiled its list of America’s highest-earning entertainers. Since 1986 Madonna has earned at least $125 million.